Yesterday a new malware was discovered by Bitdefender. The specific malware has as a target MAC computers. Security experts are expecting that as the number of apple products is rising more security threats targeting them will show up. The way this new malware works is by creating a backdoor (another point of entry to the device without owners knowledge). It allows full access to the infected device by messing up with your files, installing more malware to it, capture images and videos from your build in device live! All these remotely and anonymously. 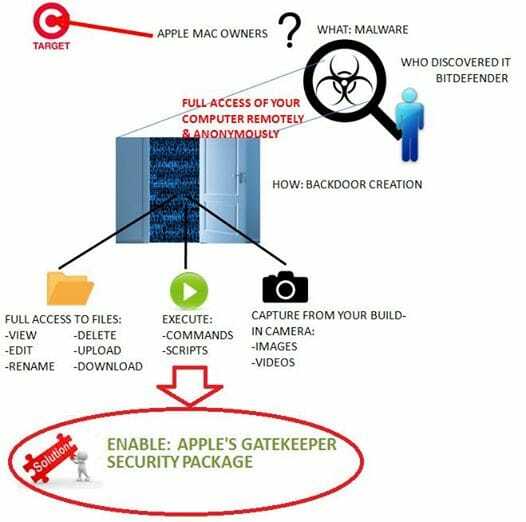 The solution is to enable the Apple’s Gatekeeper security package because of the fact that the malware does not have Apple approval certificate. MYTH: APPLE PRODUCTS ARE NOT DANGEROUS. TRUTH: ALL OPERATING SYSTEMS CAN BECOME DANGEROUS.